FANBOY PLANET.com . : gene-wilder-retirement :. 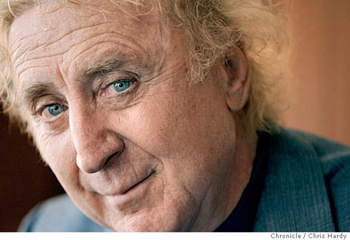 What Role Would Bring Gene Wilder Back? Give credit to Aint It Cool News and Eric "Quint" Vespe specifically for picking up a tip that could make for one heck of a good cinematic 2016 -- or 2017. As always with a rumor, this could turn out to be nothing -- but we really want it to become something. Allegedly, Steven Spielberg has been having discussions with Gene Wilder about bringing the actor out of retirement for one of his upcoming projects. The 82 year old actor has considered himself basically retired for years, not appearing on camera since 2003 when he guested on NBC's Will & Grace. "I don't like show business, I realized," he explained to Alec Baldwin on a TCM special Role Models: Gene Wilder. "I like show, but I don't like the business." In the past few years, he has focused on writing, releasing some novels and short stories. But he did soften a bit on his retirement stance in a 2013 interview by Kenny Herzog. "It’s not that I wouldn’t act again. I’d say, 'Give me the script. If it’s something wonderful, I’ll do it.' But I don’t get anything like that." Has he gotten anything like that in 2015? Yes, having Wilder return for one last Roald Dahl work -- he is iconic as Willy Wonka -- would be sweet. However, and let us please again remember that this is completely pie in the sky thinking on Quint's part, but very cool, Spielberg has another project coming that could sear Wilder into the imaginations of audiences one last time. Set for release in December 2017, the film adaptation of Ernest Cline's novel has a role that, if the script pushes back the timeline a bit, would be perfect: James Halliday. In the novel, Halliday is the reclusive technological genius who created OASIS, a virtual world system that has basically become the retreat for most of humanity after governmental collapse. Halliday himself appears in the story in virtual form. Before the novel begins, he has died and left a huge scavenger hunt -- yes, the possibility of golden tickets -- within OASIS. The winner gets control of it all. If the script is good -- and we have no reason to believe it's not -- could that get Wilder to act once more? Or could just the collective goodwill and love of his fans do it? Or how about both? Right now, it's just internet dreams, but Spielberg and Wilder both have built careers on making dreams come true.